I just got my Metrobank credit card statement today. I had some additional earned rewards points from heavily using my card lately and I wanted to check out what I could exchange the points for. So I checked the footer of the billing statement looking for a website. 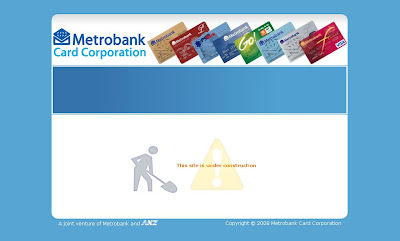 They have their website www.metrobankcard.com listed. I visited the site only to be greeted by a "Under Construction" note. Not a good impression especially for a bank in my opinion. Looks like I have to go through their customer service via phone... sigh.